This classic image of the Pillars of Creation inside of the Eagle Nebula reveals a stellar nursery where new stars may be hatched. In 1995, the world was astounded by the Hubble Space Telescope's beautiful images of the Eagle Nebula, a cloud of interstellar gas and dust 7,000 light-years from Earth. When Swiss astronomer Philippe Loys de Chéseaux discovered the Eagle Nebula in the mid-18th century, he described only the cluster of stars surrounding it. Charles Messier independently rediscovered it in 1764 as part of his catalog, dubbing it M16. The first image of the nebula appears to have been made by American astronomer Edward Barnard, in 1895. Now, astronomers know that the Eagle Nebula is a 5.5 million-year-old cloud of molecular hydrogen gas and dust stretching approximately 70 light-years by 55 light-years. (A light-year is the distance light travels in a year, which is about 5.9 trillion miles, or 9.5 trillion kilometers.) Inside the nebula, gravity pulls clouds of gas together to collapse inward. If enough gas is present, nuclear fusion ignites in the center, and the compact cloud becomes a shining star. Scientists suspect the Eagle Nebula has several star-forming regions within it. A tower of cold gas and dust rises from the Eagle Nebula. This enormous stellar nursery lies 7,000 light-years away in the inner spiral arm of the Milky Way, known as the Sagittarius Arm, or the Sagittarius-Carina Arm. In Earth's sky, the Eagle Nebula is found within the constellation of Serpens. Amateur astronomers can view the nebula with low-powered telescopes or with a pair of binoculars. They'll be able to see approximately 20 stars clearly, surrounded by gas, dust and the light of dimmer stars. Under clear and dark viewing conditions, observers may also glimpse the nebula's famous three pillars. 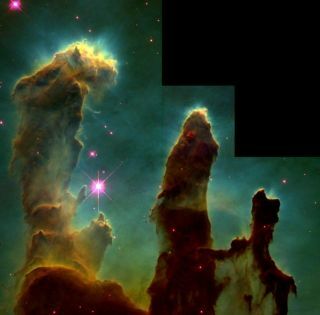 One of the best-known pictures of the Eagle Nebula is the Hubble Space Telescope image taken in 1995, highlighting three giant, gaseous columns called the "Pillars of Creation." The three columns contain the materials for building new stars, and stretch 4 light-years into space. Similarly, research from 2007 suggested that a stellar supernova 6,000 years ago could have already blown the pillars out of formation and into space. Because light takes time to travel, it may be another thousand years before we can confirm their demise. In 2015, 20 years after Hubble's first iconic photo of the Pillars of Creation, the space telescope photographed the region once again, this time with upgraded equipment. The new images were sharper and the telescope's advanced equipment allowed it to capture an image of the region in infrared wavelengths that penetrate beneath the gas and dust to see stars embedded in the pillars. The images revealed that the pillars had changed over the past two decades. For example, the long jets of gas shot out by still-developing stars were now at different spots in the pillars. The Eagle Nebula is so giant and bright that amateur astronomers don't need equipment as sophisticated as the Hubble Space Telescope to view this magnificent star cloud. Check out this impressive example sent to Space.com in 2013 by astrophotographer Terry Hancock. Peering inside of the Pillars of Creation reveals hot young stars sculpt the pillars of gas and dust that form baby stars. Evaporating gaseous globules, or EGGs, are dense pockets of gas that lie at the top of the columns of the Eagle Nebula. Some EGGs appear as tiny bumps on the surface, while others have been completely uncovered or even cut off from the pillars. The EGGs persist for 10,000 to 20,000 years. Although some EGGs will eventually collapse into new stars, others lack enough gas to create a new stellar candidate. The EGGs aren't small — they stretch across about 100 times the Earth's distance to the sun (the Earth-sun distance is about 93 million miles, or 150 million km). Each EGG is about the same size as our solar system (counting the faraway Kuiper Belt and the Oort Cloud of icy objects). See more captivating images of the Eagle Nebula from NASA. Read more about the Eagle Nebula images and data collected by the Chandra X-ray Observatory. View the top 100 images captured by the Hubble Space Telescope. This article was updated on April 18, 2019, by Space.com contributor Elizabeth Howell.